← Sodium: How Much Is Too Much, and How Little Is Too Little? Aug. 29,2015. Aussie Bites have been changed recently..the label now reads “Organic” and the bites are smaller and the taste defitinely not as good. Aussie Bites were my favorite , but now Universal Bakery has lost a customer. Thanks for the update, JW. Will have to see what we have here. I’ve just discovered these Aussie Bites and like them a lot. Thanks for your comment. They are certainly close to the Sunrise Bars in taste and construction. They are delicious, but could still be delicious (and nutritious) if they cut the sugar in half. With the apricots, honey, cane sugar, invert sugar and raisins they are WAY too sweet!! I don’t put 2 teaspoons of sugar in my coffee, why would I want 2 teaspoons per biscuit. If they cut the sugar in half, I’d buy them for sure. By the way, they are sold right beside the one bit brownies which have a fairly similar nutritional label. Obviously not organic, but your blood sugar doesn’t differentiate. BIG TIME FAIL!!! They last a long time too. I’m thinking that they are more palatable with sorbet on them, but that there’s still the sense of something umami blockaded by coconut sugar or such. Maybe 2 hours of exercise and inability to eat more brings their succor quotient up. These bars are the best ever. I have now replaced my eggs in the morning for these Aussie bites. I’m a big breakfast eater since I don’t eat dinner most evenings, & they satisfy my hunger. I found them at Costco & have bought the energy bars also made by the same company but like the aussie bites better. I hope Costco never ceases to carry them. One suggestion to the company is to add cinnamon. I sprinkle my own but if it was baked into it , they would definitely taste even better. I loved these when I first saw them months ago. They seem to have an addictive quality for me! Ha ha! But last night I discovered they were made with Canola Oil – a genitically modified product (GMO)! This negates all efforts at being a healthy treat for me. What’s the point of using organic ingredients if you use one that is blatantly toxic to your body? Was this an oversight? I will not buy these again. Thank you for posting. Hi Ellie! That was going to be my comment. Ugh… Yuck! CANOLA OIL. I read about the history of canola oil years ago and after learning just how toxic this ingredient is, I have avoided it as much as possible. However, that isn’t easy. I’m always amazed to see how many so-called “health foods” contain canola oil. So disappointing! I mean – with all of the amazing choices in oils we have out there these days…. why chose canola? Perhaps it’s due to ignorance or perhaps because it’s super cheap… or maybe both?Also very commonly found on ingredient labels is: Sunflower and /or Safflower and/ or Canola Oil (or a mixture of). “The real problem with the name “rapeseed oil” is that the oil was so toxic that the FDA banned it for human consumption in 1956. So when Canadian growers bred a new variety of rapeseed in the 1970s with a lower content of the toxic erucic acid, they decided they needed a new name for it. That’s inane about canola oil; the hulls have ricin, so like red peanut cauls, hand processing it (in 1953…) is considered harmful. NaturalNews rants on in subtlety-free terms that canola isn’t the same as cooking with fresh avacado or salmon oil…then throws more historical guts on its fire. Nope. Not a fault it doesn’t say ghee, olive oil, red palm oil (unrefined) or virgin coconut oil. Let us know if you broke the code and sent those versions on to production, though. I laughed out loud when I read your comment, “I eat about 50 calories worth”. For someone who has no idea about these yummy little morsels is that they are about the size of a golf ball. Do you mean to tell me, that a grown man, takes a bite that only consumes one THIRD of this “golf ball”, and considers this a snack? You wrap up the other two thirds, for the next two snacks? Even my grandson can eat two without thinking twice about it, and he has yet to start school. The only person you’re really lying to is yourself. Lying about what? Taking small bites? Do the energy bars need to be refrigerated? It should say so on the package if they do. 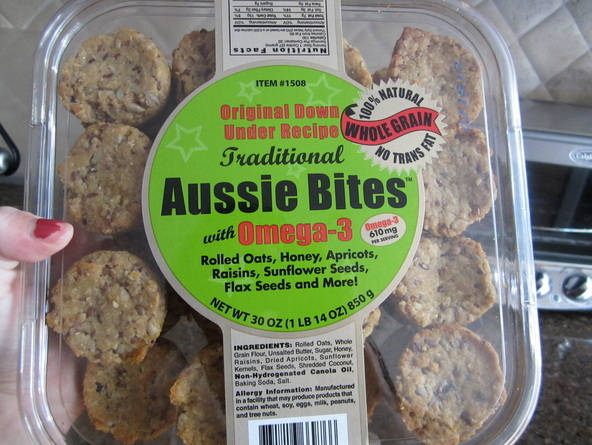 O have had Aussie Bites for six (!) months on my boat on the tropics, and a whole pack in my unheated house in BC over the winter, also for six months- and zero mold ranciness, or any other deteriotion. I wonder what majes them last lije nothing else? Thanks for your comment. That is an amazing fact.